As a new blogger, I am constantly looking for ways to make improvements and reach a larger audience. I have reviewed a number of resources and my goal is to take away at least one new element from each. 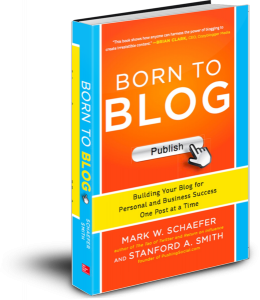 I recently read Born to Blog, by Mark W. Schaefer and Stanford A. Smith. Written for those who are just getting started, this book provides excellent information to help newcomers find success. My greatest takeaways are laid out below. Blogs are a noninvasive, trust-building, relationship booster: This stood out to me because, when done right, I have seen how powerful a blog can be. There are five elements to writing a successful post: 1. Create a captivating headline. 2. Give a unique personal viewpoint. 3. Take a personal risk. 4. Create an entertaining spin. 5. Use words that sing. Blogs offer the most potential value for businesses. The benefits include brand awareness, direct and indirect sales, sales support, R&D, PR, crisis management and expanding search engine traffic. There are specific traits of a successful blogger; tenacity, focus on passion, flexibility, consistency and courage. Tenacity in blogging comes down to working for years to start to build something; there is almost never instant success. Without passion, failure is likely just a short time away. The true passion has to shine through in each post. It can’t be “all business.” People want to find out what you have to say. Consistency in blogging means new posts at least once a month; there are many reasons for this and daily can become even easier over time. Every post doesn’t have to be profound, but does have to give some value. Courage is likely the single most important element; sometimes just to hit the publish button. There are three areas where blogging goes wrong; the wrong purpose, the wrong content and the wrong people. Blogging must be done to tell you or your company’s story and share the core values. The content must be real and connected to what you or your company are all about. The people must be authentic and likely working for the company itself; not outsiders. There are eight ways listed to develop readership for your blog. 1. Give away your best. 2. Add your blog to your current marketing efforts. 3. Contribute to other publications. 4. Get active on your reader’s social channels. 5. Use savvy, simple SEO; research keywords, optimize blog titles and post content. 6. Use guest bloggers. 7. Join and sponsor conversations, such as Twitter chats and discussion forums. 8. Reward your readers. Bloggers for a company should come from every level, ranging from entry to C-suite, and training and support should be given to ensure quality and consistency. These few items are just a portion of the pages of notes I wrote down, but were the ones I felt most applied to what I am doing with my own blog. If you are looking to start blogging or would like to get a fresh perspective to improve your current blog, I would encourage you to check out the book.